* The adapter differs for different mounts. The standard package should include a mount adapter (type to be specified when ordering). However, some dealers may sell the PoleMaster without an adapter or sell the adapter seperately. To install your PoleMaster onto the mount, you will need an adaptor specifically made for your mount. The illustrations below use the Skywatcher NEQ6 mount adaptor as an example, but the instructions apply to adaptors made for other mounts. The mount adaptor comes in two parts. There is a camera base disc which is attached to the back of the camera body; and there is a mount ring which is attached to the polar scope aperture of your mount. In use, the camera disc is attached to the mount ring by thumbscrews (the picture below shows the mount ring already attached to the mount, while the camera base disc is held in the hand). 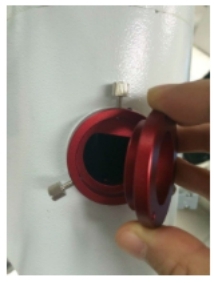 To install the mount ring, simple insert it into the aperture / hole of the polar scope. Occasionally, the fit can be very snug due to variations in the thickness of paint that is on the mount. You can either scrap off some paint or use a rubber mallet to gently push the ring squarely into the polar scope aperture. One the ring sits squarely in the aperture, secure the ring to the aperture using by tightening the grub screws using the allen key provided from within the aperture of the adaptor ring. You only need to perform this step on your first use. Attach the camera disc to the back of the camera body using the bolts provided. You only need to perform this step on your first use. In use, place the camera (with its camera base disc attached) onto the mount ring and secure the camera in place by tightening the thumbscrew. The USB port of the camera should be directed to the left side when you are facing the camera. When not in use, you can either leave the camera on the mount attached; alternatively, you can remove the camera (with its camera base disc) from the mount ring by loosening the thumbscrew. Always protect the camera lens using the screw-on lens cap when not in use. 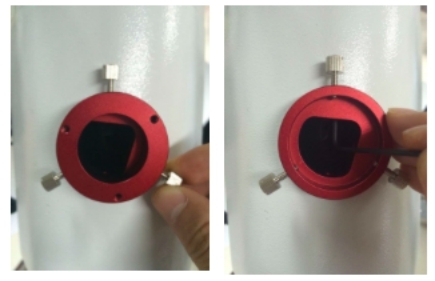 If you choose to remove the camera, you may also want to prevent ingress of dust, dirt, bugs, etc into the mount through the mount ring by covering the mount ring opening with the adaptor cap provided. Unzip the files and run the executable files following the on-screen instructions. If Windows gives any security warning during installation or during the launch of the Application, you must choose “Yes” to allow the Application to run properly. Before you use the application, you should have the mount roughly polar aligned. This can be achieved by aiming the mount due North (Northern hemisphere) or due South (Southern hemisphere) using a orienteering compass; and the adjust the latitude setting on the mount to match your local latitude. Refer to your mount manual on how this should be achieved. The purpose of this rough alignment is such that your pole star will be visible to the camera. 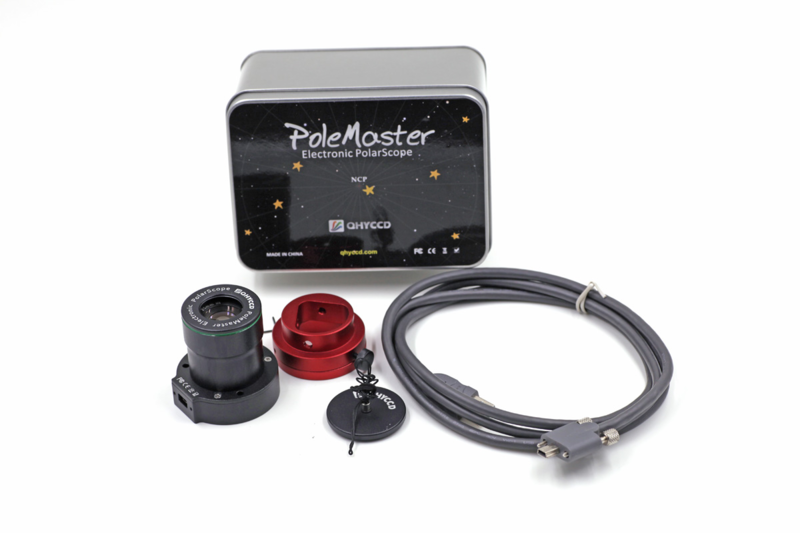 (Polemaster has 11x6 degrees of field of view and in most circumstances the pole star should be visible if the mount has been rough polar aligned). Connect the camera to your computer with the supplied USB cable. During the first use, the computer will recognize the camera and install the driver for the camera. Choose “Connect” on the menu. Choose either Northern or Southern hemisphere. Enable “Astronomical Refraction”, if you wish. Enter your local latitude and longitude. Adjust the exposure settings (gain and exposure time) to optimize the display. Ideally you should adjust the setting until you can clearly see the pole star (Polaris in Northern hemisphere and sigma octantis in Southern hemisphere) plus a number of adjacent stars. Click “Finished” when done. 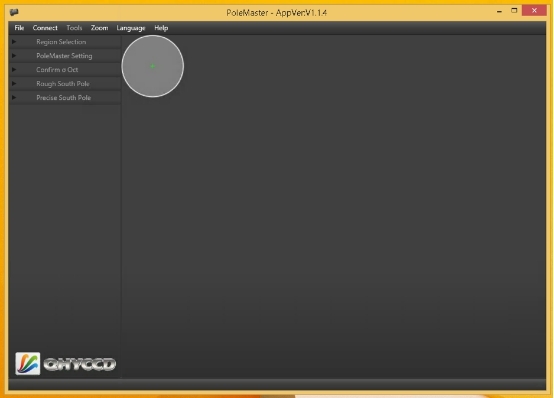 This picture shows how the Polarise looks like in PoleMaster FOV. Locate your pole star on the screen. 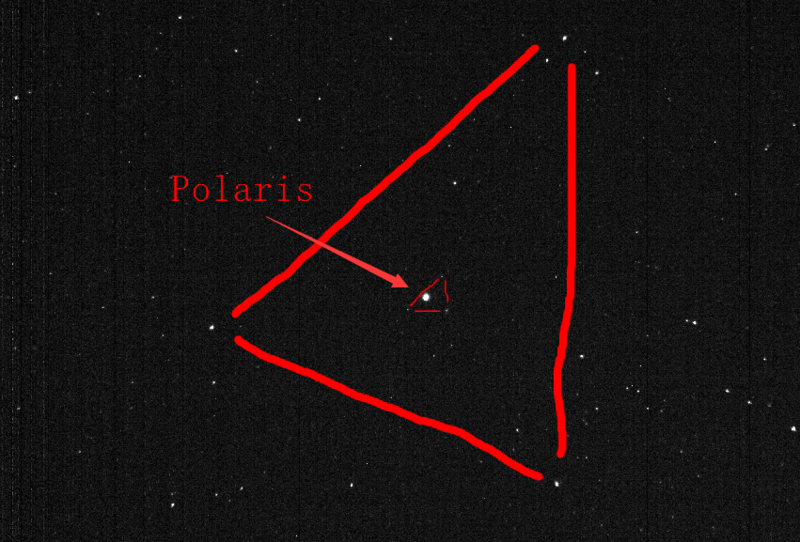 Double click on the pole star (Polaris or Sigma Octantis). If you have difficulty identifying the pole star or if you are not sure whether the pole star is on the screen (i.e. rough alignment is not good enough), you can save the screen as a .bmp file by choosing “File” then “Save as BMP”. You can plate solve the BMP file using a number of free plate solver, including the online nova.astrometry.net. This will tell you which star is the pole star, or if the pole star is there at all. This is particularly useful for Southern Hemisphere as Sigma Octantis can be difficult to identify. 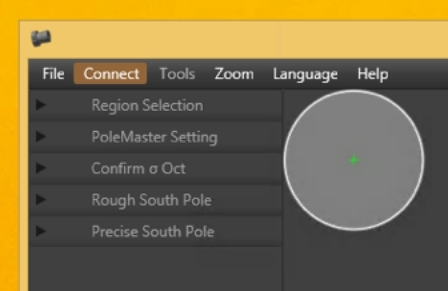 Once you have double clicked on the pole star, the application will ask you to align the overlay to match the display. The aim is to line up the stars adjacent to the pole star with the on-screen overlay. 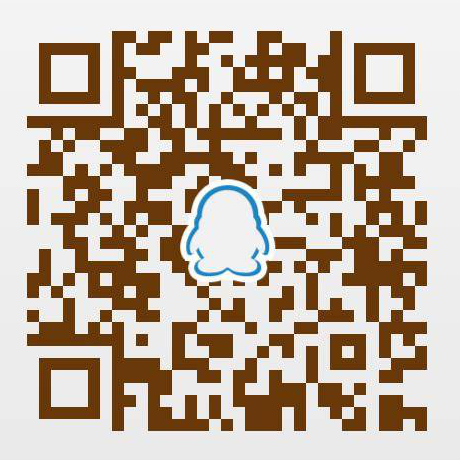 You can rotate the overlay by either using the keyboard arrow keys or by sliding on the slider tool maked “Rotate”. You can also use the middle scroll wheel of your mouse if the mouse cursor is over the slider. At the end there should be a star visible in each of the red circle of the on-screen overlay. If this is not the case, verify that you have indeed selected the correct star as the pole star. Click “Success” to proceed to next step. 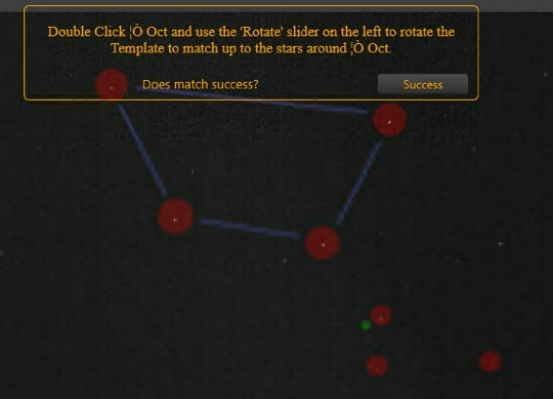 Choose a bright star adjacent to the pole star in the next step by double clicking it. To make the process more accurate, it is best to use a star that is not too close to the pole star. The on-screen instruction will prompt you to rotate the mount. In this step the application will try to determine the mechanical axis of rotation of your mount. To do that, keep an eye on the bright star that you selected, while slewing your mount using your mount control (usually the East button will rotate the mount in the direction required by the Application – some experimentation is required). Rotate the mount such that the star moves by about 15 degrees. Click “Finished” then double click on the bright star again. Repeat one more time. Please make sure you are using the handset controller or computer software (like EQMOD, ASCOM etc) to perform the rotation. Don't manually perform the rotation by loosening the RA clutch as it will cause the rotational center to shift and result in large apparent error. Click “Correct” if the bright star moves along the circle. Click “Reset” to try again if it does not move along the circle. Double click on the pole star again and match up the on-screen overlay as per the earlier step. Click “Success” when done. On the screwn there is a small green circle. This is where your pole star should be. Use the mount azimuth and altitude adjustors, align the pole star with the green circle. When done, click “Finished”. Fine polar alignment is achieved when the small green circle and small red circle become aligned. Click “Finished” when done or “Restart” to try again. Please note there must be a star in each of the green box. If there is no star in it, the pole axis position cannot be determined. The green circle will drift randomly as a result. After monitoring is started, as long as a GOTO has not been executed, the software will continuously determine the pole position frame by frame. If the mount is moved by accident and polar alignment is lost, the alignment can be restored by adjusting the mount to bring these two stars back into the green rectangle box. The pole position will be determined again and you can further adjust the mount to get it well aligned again. After a GOTO, the stars will no longer be within the green boxes, but it is possible to rotate the green boxes to align them with the stars again manually. 1. Why is the calculated pole position changing from time to time? Atmospheric condition will cause the apparent star position change slightly from time to time. It is best if you monitor the pole position reported and adjust the mount when the reported pole position is relatively steady. In low signal to noise condition (for example, in the presence of heavy light pollution, increased cloud cover), the fluctuation may become excessive and may even disrupt the software enough that the two stars are no longer within the two green rectangle boxes. You need to ensure that the same two stars remain in the green boxes at all time for valid pole position calculation. 2. Is it necessary to install PoleMaster coaxial to the RA axis? No. You will only need to have them approximately aligned. The rotation center determination is determined algorithmically and does not rely on accurate mechanical alignment . 3. Use in low latitude location? At locations of low latitude, atmospheric refraction can become a significant factor and affect the perceived pole position. The latest software has included atmospheric refraction correction by shifting the calculated pole position. The direction of shift is towards the horizon. You need to check the direction on the PoleMaster video display. 4. How to test the precision of the alignment? For example: if in one hour the DEC drift is 3arcsec, the precision is 6*3=18arcsec. 5. When selecting a star using the mouse, how accurate does one need to be?. The software will determine the star position based by weight centroid algorithm rather than merely using the cursor X-Y position, so one does not need to be exact when selecting a star. 6. Why is the star is not round on the display? 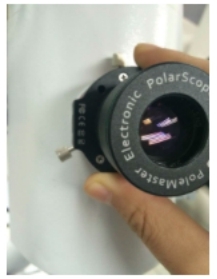 The lens used in PoleMaster is working at maximum f-stop and some optical aberration may be visible but it will not affect the calculation because the software use the weight centroid algorithm to determine the star position. 7.When using the PoleMaster, is it necessary to stop RA tracking? No. It is best to keep tracking on when using PoleMaster. 8.Why can't I get the good PA precision? (1) Polar alignment accuracy should be measured by the amount of declination drift. Polar alignment errors as reported by other means may not be accurate as they are influenced by atmospheric refraction and in some cases, by the mount characteristics such as backlash. 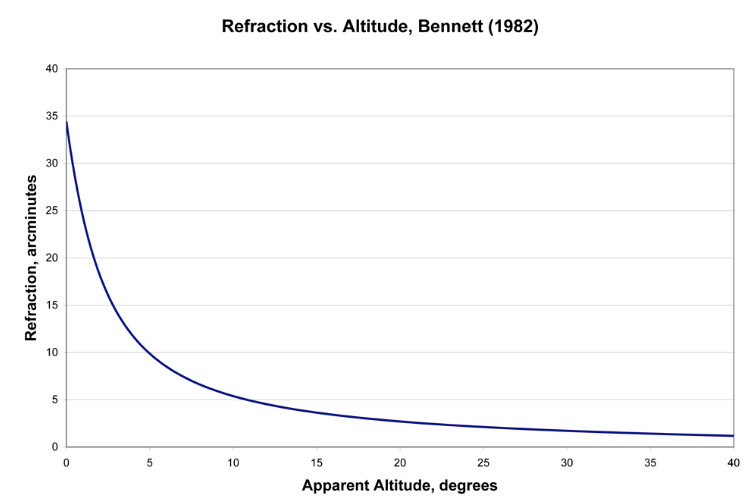 (2) Check that the RA axis has been correctly determined. The accuracy of the RA axis is verified when one can see the star moving along the green circle. If the star does not move along the green circle, you will need to repeat initial steps until it does. (3) In low latitude location, atomospheric refraction correction should be turned on. 9. Does Polemaster software allow for different epochs? Current PoleMaster software version calculates the pole position for the period between November 2015 and May 2016. We will publish a new version for the next five years. 10. Can the PoleMaster work with Fork mount? Yes, Please take an reference of this setup by one of PoleMaster user. if you need connect the PoleMaster to a tripod connector, you can use the PoleMaster Generic Portable Mount adapter. Which has a screw hole for the tripod screws. 11. Does PoleMaster Suppor WINDOWS Vista? No. Due to the DirecX version issue the PoleMaster can not run under Windows. 12. 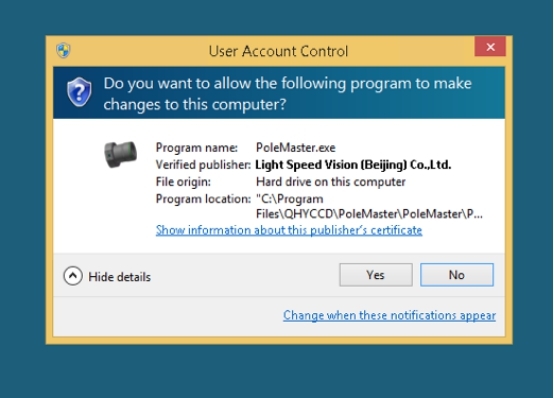 Does PoleMaster support WINDOWS7,8,10? 13. Is the PoleMaster MAC/OS version avalible? Yes,We have a beta MAC/OS version.Please download it at PoleMaster web page. http://qhyccd.com/bbs/index.php?topic=5349.0 There is some bug report on some MAC computer the software may crash but some is not. QHYCCD will keep on debugging. 15. I find some hot pixel on the image. Is this the sensor problem? Is there any affect to the calculation? No. 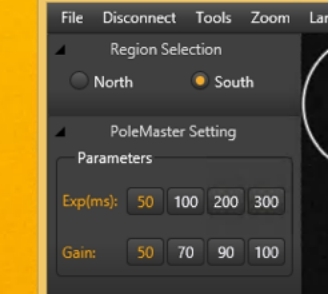 The PoleMaster use the median filter to remove all hot pixels before calculation. There is no any problem for these hot pixels. And hop pixels is very normal for uncooled camera in high gain and long exposure more than 100ms.